A Symposium was held at the British Museum in March 2010. Twenty-seven papers were delivered and there was much useful discussion. Summaries of many of the papers, together with some of the discussion and subsequent thoughts, will be added to this page over the next few months. In some cases, the embedded images have been processed to allow for a zooming image interface. 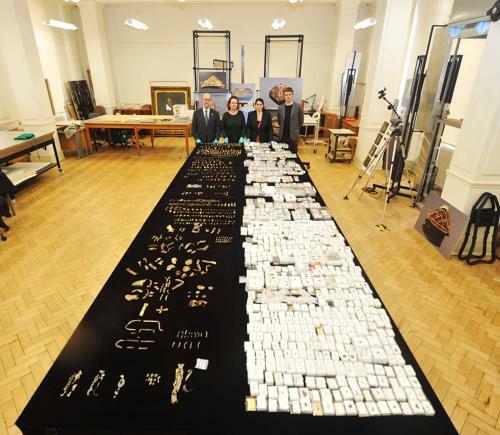 Records for the objects in the Hoard are being added slowly, in a skeleton format, which will be enhanced as more data becomes available following research, conservation and time being available to update them. These can all be accessed via our database record for the hoard. The current iteration of the Hoard's website went live after an extensive development period and now has video content and lots of visiting information. The old site will still be available via this site and we will shortly be pulling in Flickr images for the Hoard to these pages. The papers have been edited by Helen Geake, Finds Adviser (early-medieval objects) to the Portable Antiquities Scheme. The pages have been built by Dan Pett, ICT Adviser to the Portable Antiquities Scheme. Thanks to all contributors for generously allowing us to publish their early thoughts on the Hoard.